There's this super cool iPad app called Let's Create Pottery, and you can make pottery on the screen and then you can even order it to be made by a 3D printing service. Pretty cool. Expensive tho. 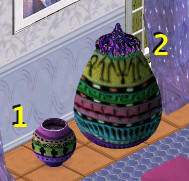 Cheaper just to let my simmies have them, great idea from Suva! Well this seems like a pretty nothing item to make really, but believe it or not, I needed it, LOL! I like to space out the draped fabric and I couldn't do it because I didn't have any empty railing! Problem solved. 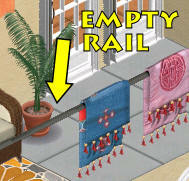 There's plenty of hints in the pic as to where the fabric draped over the rail is from, if you can't figure it out, PM me. All five of these requested posters are backless and go for �15 ea. in the buy catalog. They are readable in both visible rotations and have custom thumbnails for the buy catalog. 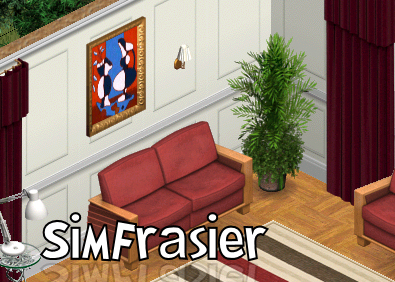 Original artwork by me, which was an homage to a Frasier TV show set painting. Learn more about it here. This object took me a full 40-hour work week to complete... Z-sprite hell. I have it in 6 colors, so just forum PM me if you need another color of it that bad. that is fine. Peacock desks requite Hot Date I believe. pretty tables in 6 colors. Lace top credit to Xu�n Sims. The green table is available at her site. The other colors are here. 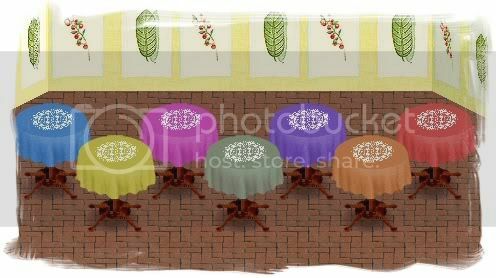 Click pic to see a larger image that shows all of the table colors available. All objects available without babies at Reny's. go on at night! All objects decorations only. Cloned from the party plant object by Inge Jones. Rehacked and recolored to max all motives except fun and fun/social. Sims will play or do fun/social things until these are removed including Sim Twister, birdy chairs, gymnastics or playground stuff. Curled up fast asleep deco cat can sit on most sofas or chairs for storyboarding. Some sims can sit in the same spot and it appears the pet is in their lap. No expansion packs are required for this deco object. So cute sitting on furniture deco dog can sit on most sofas or chairs for storyboarding. 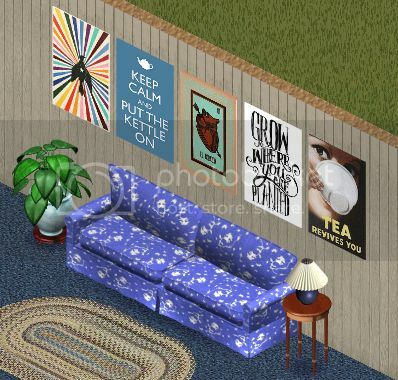 Some sims can sit in the same spot and it appears the pet is in their lap. No expansion packs are required for this deco object. So cute sitting on furniture deco cat cat can sit on most sofas or chairs for storyboarding. Some sims can sit in the same spot and it appears the pet is in their lap. No expansion packs are required for this deco object. So cute sitting on furniture deco cat can sit on most sofas or chairs for storyboarding. Some sims can sit in the same spot and it appears the pet is in their lap. No expansion packs are required for this deco object. room wallpaper. Photo album inspired by TV show here. One large, one small and a group of 3 as seen here. Great decorations for your oscar night parties. objects mean something to me. Some people feel the need to make comments about these objects in forums and all I can say is if you don't like these things don't download them! The greatest racehorse to ever live, who coincidentally had a heart condition similar to mine, so he is very special to me. a blonde, a brunette and a redhead? I think not.